We are pleased to announce the launch of Power Manager and Power Manager Pro 4.6. This significant update introduces new Schedule Assistant tasks, Dark Mode support, and numerous refinements. We have also continued to work on the internal scheduling engine to ensure it remains modern and efficient. New: Added Schedule Assistant to execute a command line tool on-demand. New: Added Schedule Assistant to execute a command line tool once. New: Added Schedule Assistant to execute a command line tool daily. New: Added Schedule Assistant to execute a command line tool after inactivity. New: Added Schedule Assistant to execute a command line tool before sleep. New: Added Schedule Assistant to execute a command line tool after power on or wake. 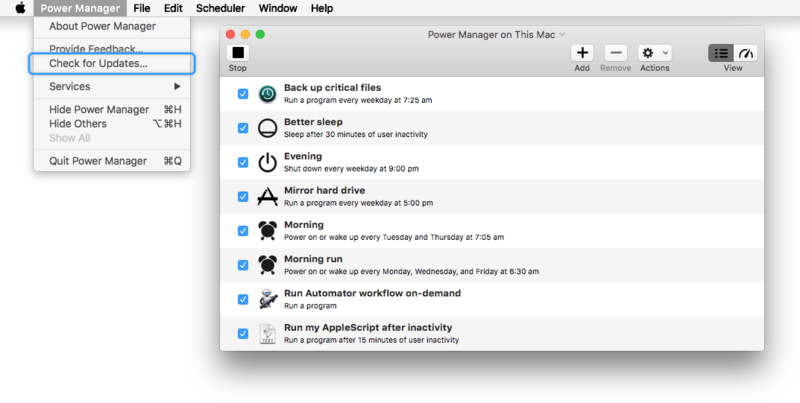 New: Added Schedule Assistant to run a script after power on or wake up. New: Added dark mode support to status menu bar. New: Added delay by 60 minutes to status menu bar. New: Added advance counterparts for delays to status menu bar; press Control key to reveal. New: Added sun trigger artwork. New: Added executable action artwork. New: Added argument suggestions for absolute path, UUID, and volume UUIDs. New: Added handler for applying licence via URL. Change: Disabled fading of status menu bar icon for distant triggers. Change: Modernised how artwork is determined for an event. Change: Updated documentation to refer to macOS instead of Mac OS X.
Bug: Fixed bugs and potential memory leaks to improve stability.